In my previous post, I discussed the geology of Watkins Glen. 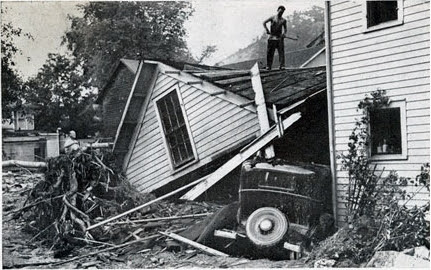 Today I'd like to say a few words about the flood of 1935 which greatly affected this area. In July 7-8, 1935, a slow-moving low pressure system stalled along a cold front in central New York, merged with a system which had moved up the coast, and then intensified. A number of thunderstorms described as "extraordinarily severe" by those living in the area dumped nearly a foot of rain within 48 hours in a band just south of the Finger Lakes causing massive flooding in the Southern Tier (the "Finger Lakes Flood"). As one eyewitness described the storm: "After a week of good weather, thunder storms were forecast for the afternoon of Sunday, the 7th. They arrived about 4:00 p.m. and the water came down harder than I had ever seen it rain before, or I have since that deluge." Major flooding occurred along many rivers and streams in the area inundating towns and cities throughout the Southern Tier and Finger Lakes Region. 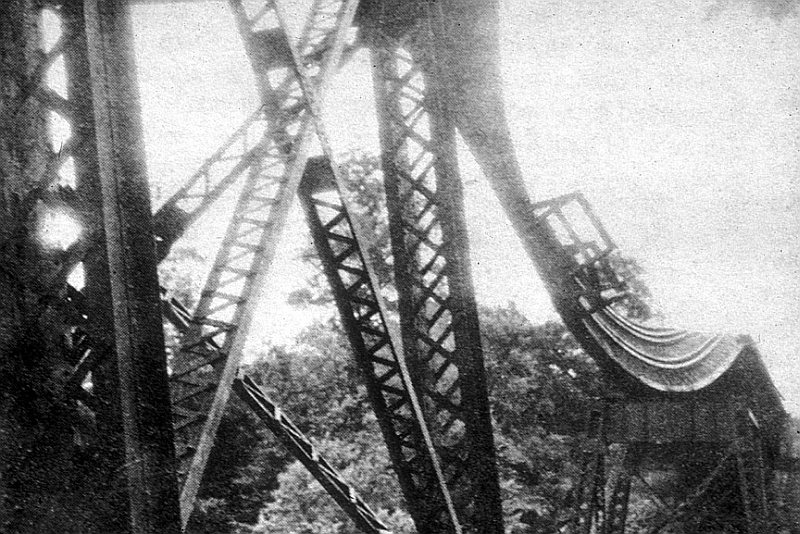 As it does today, a railroad bridge ran over the upper part of Watkins Glen and a trestle was in the middle of Glen Creek. Floodwaters lodged debris against the trestle, water dammed up behind it and eventually the trestle itself broke away and washed downstream with a massive wall of water. 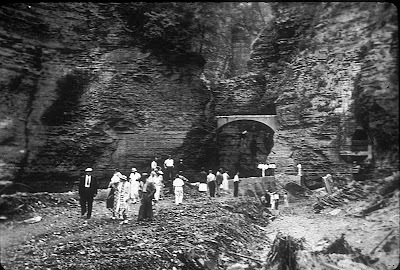 The water roared down the Glen, emerged, and then ripped through the village of Watkins Glen causing widespread destruction. I couldn't find any pictures from the inside of the Glen, but the entrance area clearly showed major damage after the flood. Pre-flood (above) and post-flood (below) pictures of the entrance to the Glen. 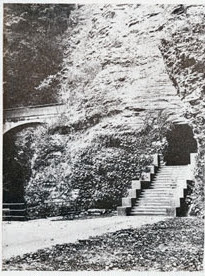 Note the stripped vegetation, railings missing from arched bridge, and washed away stairs. Prior to the flood, much of the trail through the Glen was composed of wooden stairways and walkways. After the flood, the Civilian Conservation Corps did much of the stone and masonry work seen on the beautiful walk through the Glen seen today. While the flood was a tragedy for the people living in the area at the time, these types of events are completely normal over time spans of decades or centuries and are a part of the natural forces shaping the Glen. While slow and gradual erosion occurs 24 hours a day, 7 days a week, 365 days a year as the stream flows down through the gorge with its normal load of abrasive sediments, every once in a while a flood, and sometimes a massive flood, occurs causing a great deal of erosion in a very short period of time. As the geologist Derek Ager once famously said: "...the history of any one part of the earth, like the life of a soldier, consists of long periods of boredom and short periods of terror." Floods are not freak events. They're a normal part of the natural geologic cycle. Where are all the videos?